Tonjoo and PayPal, a leading online payment system, have announced a partnership which will allow Tonjoo to offer superior support to its current and prospective clients using PayPal. This partnership will help Tonjoo & its clients in more than one way, providing up with the following benefits. In this tutorial we will guide you how to integrate Tonjoo Theme Options Maker (TTOM) into your WordPress Theme. Please note that the current version of TTOM is only come in plugin version. So every theme using TTOM must have TTOM installed on their plugin. WorPress page template is a feature that enable us to create different layout for each page in our website. In this tutorial we are going to create a new Page Template called “Contact” . This tutorial is using the default Twenty Fourteen theme. However this technique can be applied to other themes, we choose Twenty Fourteen to simplify matters. A cross-browser boilerplate for centering text with before after image. 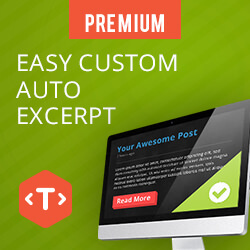 Easy Custom Auto Excerpt is wordpress plugin to cut/excerpt your post displayed on the home , search or archive pages. By using this plugin you don’t need to excpert your post manualy, just active the plugin, configure the word length and you’re good to go. Last week i got a project to develop a small HTML5 web pages as that behave like a powerpoint slide. This web application is going to act like a flash replacement. So the user must be able to run this web app with a double click on the file. One way to accomplish that task is by using command line script either in mac or windows. We’re going to use bat file in Windows to do this task. Sangar Slider is a premium high quality slider plugin for WordPress. With smooth animation, layered slide, touch and swipe support, easy to use and trully responsive. Packed with premium skins and template, and also easy to create your very own custom template for your slider. 10 template, 15 preset & 90 theme!